EN 179 standards for emergency door exits. This standard specifies that a lever handle or pad should be fitted to exit doors. The handle has to be of a certain length and height. Exit for people exiting the final door of a building should be with one movement of the body. EN 1129 standards for emergency exits specify that a panic latch should be fitted in public buildings like halls and cinemas. Exit should be possible using only a single touch. EN 14846 standards for specification of egress hardware for emergency exit doors fitted with electronic locks and access control. Two exit type buttons or mechanical handle should be fitted for safe egress. Construction Product regulations 2013 Act legislates for the quality of door hardware. It is a criminal offence since July 2013 for building managers and installers to permit EU non-compliant products on fire and emergency doors. Products should have a DOP certificate to validate the CE marking. Equality Act 2005 / DDA Act is compliance for disabled persons to enter and exit a building easily and without hindrance and discrimination. Private Security Act 2004 provides for the installation, repair and servicing of access control, locks or door closer fitted to any common door operated by two or more intercoms or other access controlled devices. Contractors engaged to work on access controlled doors must hold a current PSA security license to install and maintain the hardware on access controlled doors. It is a criminal offence to engage an unlicensed contractor and any insurance claim may be invalidated by engaging an unlicensed contractor. Licensing for the installation, opening and servicing of locks & safes and the supply of security and master keys will be introduced in 2014. Only licensed contractors will be able to install, repair and open locks or supply security keys with authorisation. PRSA licensing is conditional on compliance with these and other regulations. Noncompliance with any of the above may affect an insurance claim. Doors are a very important part of the building security and safety. Every effort should be made to have heavy duty doors at main entrances that will withstand attempted forced entry and vandalism. Fire doors should be compliant with building regulations to curtail a fire and prevent smoke passing through the entire building. Fire doors and emergency exits should conform to the safety standards set out by the local fire officer and building inspector. 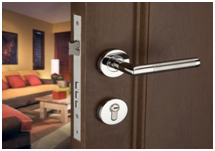 Locks are the mainstay of security for perimeter and internal doors in a building. Modern locks are typically euro cylinder operated where the barrel slides through the lock and the door from the outside to the inside of the door. These can be keyed both sides or with a thumb turn on the inside for easy exit without using a key. There are other types of cylinders including rim cylinders for Yale locks, Scan cylinders for Swedish doors. Chubb type mortise locks are still around but usually on internal doors. Cylinders are the part of the lock where the key enters and are usually mushroom shaped. Over time the cylinders wear and it is more difficult for the keys to operate the lock. It is advisable to fit a replacement when the cylinder wears as eventually lock outs occur. 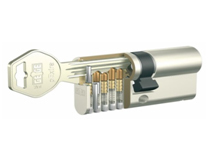 A cylinder can be replaced made up to an existing key. However if they are regular keys that can be cut in a shoe repair shop, the chances are that not all the old keys will operate the new cylinder as some of the old keys may be worn as well. Most of these standard cylinders are manufactured in China and wear very quickly and cause problems in opening. High Security and Patented Cylinders can be fitted for added security with protection from wear and tear. They are more durable than the standard cylinders with anti-pick / bump / drill and 3D printing resistance. These cylinders are operated by high security keys and require authorisation from The Property or Facilities Manager to get copied. These keys are computer originated and will always operate a replacement or keyed alike cylinder added. Tenants cannot get duplicate keys copied without authorisation from the building manager. The Patent on these key systems last for 20 years from the original date of filing. Many locks on the market are no longer patent protected and can be copied by milling machines, spurious blanks and even 3D printers. The Mul-T-Lock patent expires on December 31st 2013 and these keys can be copied legally from January 1st 2014 by any key cutter. 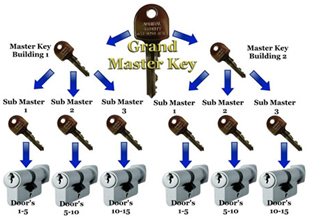 Master key systems can be supplied so that all locks in a building can be opened by their own individual key while all the locks can be opened with a single master key. It is also possible that all the same keys can open a single lock on an entrance gate or refuse shed. It is preferable that a master key system is built using a security key as it can be controlled better by the building manager. Mechanically coded / digital door locks and padlocks are suitable for doors where common access requiring lower security is required. They are practical for refuse or utility rooms. Great care should be taken that the codes are not made available to unauthorised persons as it will compromise the security. Access Control normally refers to magnets or electric locks on doors or gates operated by fobs, cards or keypads and the intercom system. Most access control systems are hard wired. You can control who has access with fobs and cards as these can be deleted from the system if someone loses their card or you want to deny access for whatever reason, this can be done by a hand held programmer on site or from a remote computer at a desk. Battery operated electronic locks and access control systems are getting very popular. These can be fitted to any door for low cost access control solutions using fobs or cards. They are cheaper than hard wired systems to install as labour costs are reduced because there is no cabling involved. They are particularly suited to doors that are not pre wired like inner doors at different floor levels or individual office doors. Property managers can still manage to control access and to replace individual fobs or cards without changing the lock or all the keys. Magnets on doors and gates are normally opened on the outside by a keypad, card /fob or a key switch and from the inside by a push button release and break glass units. Magnets are fitted to the top of the door but over time they cause the door to warp and misalign from the frame. Doors fitted with magnets break more easily when brute force is applied. If the power fails or a break glass unit is broken, the door will remain open until repaired or reset. This is commonly referred to as fail safe or fail open. Special attention should be given to magnetic locks fitted to ensure that they comply with EN standards as many of them do not. Electric locks are preferable to magnets as they are more secure in the event of a power failure or vandalism while still retaining safe egress. Electric locks are fitted to the middle of the door which prevents warping and more secure against forced entry. Electric locks can be opened by all of the above along with mechanical keys on the outside and a handle on the inside. If the power fails or a break glass unit is vandalised, the door remains locked. This is commonly referred to as fail locked or fail secure. Door and latching speeds should be synchronised properly to avoid slamming when closing. Winds can affect the door operation and high power closers should be fitted if the door is exposed. 4/5 graded closers should be fitted where necessary to ensure a smooth latching action to compliment the secure latching of a lock while preventing the door slamming and creating excessive banging and noise. Hinges and door pivots should be maintained in good condition as any excessive wear will cause the door to drop. Hinges and pivots should be lubricated frequently to minimise wear and friction. Poor quality handles fitted to doors are prone to breaking and denying users safe exit. The internal springs and clips are weaker. They break easier and disengage from the door. Handles should be fitted to the door with long screws or preferably with bolt through fixings to prevent the handle coming away from the door. IF IN ANY DOUBT YOU SHOULD ALWAYS CONTACT YOUR LOCAL BUILDING OR FIRE OFFICER TO ENSURE THAT THE LOCKING HARDWARE THAT YOU USE, COMPLY WITH THE APPROPRIATE LOCAL STANDARDS AND REGULATIONS.